Description: Each package contains 16 - 32 g low protein Veggie Meatballs. (Two meatballs per serving.) A vegetable-based savory delight rolled into meatballs. Ready to heat and serve. The delicious taste and texture will make you wonder why people eat beef. There is 0 cholesterol and no texturized vegetable (soy) protein. Contains DHA Omega-3 fatty acids! Contains 32 mg DHA per 2-meatball serving. Stove top (cooking from thawed): Thaw desired amount of Veggie Meatballs several hours wrapped securely in refrigerator. Heat a small skillet over medium-high heat with olive oil. Saute Veggie Meatballs until heated through and browned or bake in 350º F oven on a nonstick sheet for 20 minutes. Conventional oven (cooking from frozen): Thaw in Microwave for about 2.5 minutes. Bake in 350º F oven on a nonstick sheet for 20 minutes. 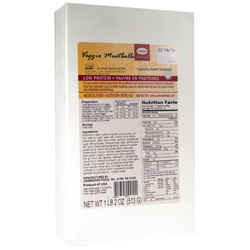 Ingredients: Mushrooms, water, butternut squash, yuca (yuca, salt), onions, crumb mixture (wheat starch, water, psyllium, canola, polydextrose, sugar, baking powder, methylcellulose, yeast, xanthan gum, salt, preservatives [calcium propionate, potassium sorbate, fumaric acid, sorbic acid]), olive oil, oat fiber, sweet potatoes, garlic, black pepper, oregano, xanthan gum, italian seasoning, char grill flavor (salt, dextrose, maltodextrin, maltodextrose, natural flavor, modified food starch, corn syrup solids, garlic powder, onion powder, natural mesquite smoke flavor, silicon dioxide), fennel seed, DHA algal oil (high oleic sunflower oil, sunflower lecithin, tocopherols and ascorbyl palmitate [as antioxidants]. Contains wheat.